Faith is a concept that operates on the principle of believing God. Man reasons with his mind, believing is done in the heart. They are mutually exclusive. The principles of faith are counter-intuitive to reason usually considered foolishness with man, going in the opposite direction. Thanks for your comment New Genesis! I would agree with you to an extent (as I argued in the first half of my post); however, I do believe that our faith is not a leap in the dark. In other words, God has given us reasons to believe, but ultimately we must step out in faith because reason cannot take us all the way. If we totally dismiss reason, we end up at existentialism (i.e., I have no reason for my faith) and I’m not quite comfortable with that position. I feel that there is a fine balance between reason and belief that must be maintained. What do you think? Am I overstating my case here? To move according to the concept of faith is not to leap into the dark. You are first propositioned by God with a commitment of his word which stirs this faith. You are not leaping into the dark, you are leaping into the light of God’s presence by this word. Reason is only helpful to the extent it helps us to identify the origin of this proposition in God. Hebrews 5:14—But strong meat belongeth to them that are of full age, even those who by reason of use, have their senses exercised to discern both good and evil (what the will of God is). Proceeding beyond identifying whether this proposition is Gods will, reason is inadequate….. lean not unto your understanding, but trust in the Lord with all your heart. Your leaning is in the spirit. Your mind is a gate which allows or disallows word of God into your spirit. From that part onward, the spirit is engaged where the mind cannot go because faith is the language of the spirit. Operating in the Spirit is a paradigm shift from the bio-physiological function of an organ with which you are endowed to navigate the terrestrial plane of existence. The eye, ear, taste, touch, smell sense cannot navigate the place to which your spirit is now called: Hebrews 12:22-24—But ye are come unto mount Sion, and unto the city of the living God, the heavenly Jerusalem, and to an innumerable company of angels, 23 To the general assembly and church of the firstborn, which are written in heaven, and to God the Judge of all, and to the spirits of just men made perfect , 24 And to Jesus the mediator of the new covenant, and to the blood of sprinkling, that speaketh better things than that of Abel. I’m pretty sure we’re talking past each other here. I agree that man’s wisdom alone is not sufficient to arrive at faith. On the other hand, God still gives us evidence along the way in order to lead us towards faith. And even after faith, the mind still plays a role. I think its important to be whole man Christians. In other words, God doesn’t just deserve my emotions and my actions, but He also deserves my mind. God saved all of me and He wants all of me in worship of Him. Jesus says that He expects us to worship in spirit (right belief) and in truth (right knowledge). Christianity is not a mere experience where we shut off our minds and just go through the motions, but neither is it a sort of intellectual exercise, a math where we know all the answers to all the equations. Christian faith is a fine balance between those two extremes. Would you not agree? It might be helpful for me if you would elaborate or clarify your meaning of talking past each other; I’d prefer not to be left to my assumption as to your meaning of it. I do challenge your allusion to truth as meaning “right knowledge”; more than right knowledge, is that lives. My understanding and as I experience it, the spirit usually connotes emotion, in this case not just emotion but wisdom,; while the mind is the product of our cerebral, analytical and sensory function. When a man dies, his senses die along with him; as do his thoughts. Thoughts are a result of chemicals in the brain generating electric impulses like a battery does; these impulses fire up the sensory functions to crawl the environment for relevant survival information. Who is like my servant hearing many things, yet is deaf, seeing many things but is blind. The spirit needs none of these function to see, hear, know. Contrary to the notion that the mind is so indispensable to the process, I say the spirit is an upgrade to the mind. He is so superior to the mind as no comparison could be relevant. This is living intelligence that supersede the “line upon line, precept upon precept” . You will be standing there by the dead person, and your mind is going to tell you; call the undertaker, plan the wake, burry the man. That’s what the mind knows; the spirit who receives the dead back to life calls to the dead and the man lives again. What I mean is that we both seem to be misunderstanding each other. Try condensing your responses into shorter sections. Instead of the long paragraphs, just condense to a simple statement. I’m struggling to understand your train of thought. Reason has a place but it’s never going to rise to the challenge that we have to meet as sons so God. It will never allow you to do what God asks of sons. What kind of short answer was that? C’mon, put up your dukes! You’re not gett’n out of this so easy. Where’s that irrepressible fighter in you? Believe me you’ll live to fight another day. I don’t agree with everything Martin Luther said but I think he got it right when he said reason is the enemy of faith. I know, I know…….You’re right. I agree with you that reason has a place. Reason is a function of the mind. Jesus commanded His followers to love God with all their minds; therefore, the mind has a role to play in the Christian faith. God created man with the unique ability to reason and I understand this to be part of the image of God; therefore, reason itself is a gift of God for a specific purpose. I agree with you that it is not the answer to our need of sanctification (my understanding of “rise to the challenge that we have to meet as sons [of] God’ and doing “what God asks of sons”). Sanctification is a work of the Gospel in my life as I work out my salvation with fear and trembling. Sanctification cannot be accomplished by mere mental exercise, but requires the work of the Holy Spirit to affect change in me. Given that I agree here, I don’t see the need to fight out the nuances. As for Luther, I don’t agree with everything that he said either, but I tend to think he’s likely referring to the abuse of reason. For instance, he indicates elsewhere: “I believe that God has made me and all creatures. He has given me my body and soul, eyes, ears, and all my limbs, my reason, and all my senses, and still preserves them.” Clearly he sees reason as a good gift of God as it was originally intended. Great points Thomas. 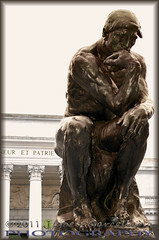 I would be inclined to say that simply the fact that we have the ability to reason demonstrates several things: (1) reason is unique to the human race and thus appears to be part of the image of God in man, (2) reason, used aright, points to its Originator, and (3) reason, like the image of God, has been marred and is not a sufficient sole source of guidance. Thank God for His self-revelation!